Our apartment is on the 3rd floor of a corner building and we have two big, beautiful trees just outside our windows. In fact, the branches are so close they very nearly touch the windows when the wind blows hard enough. 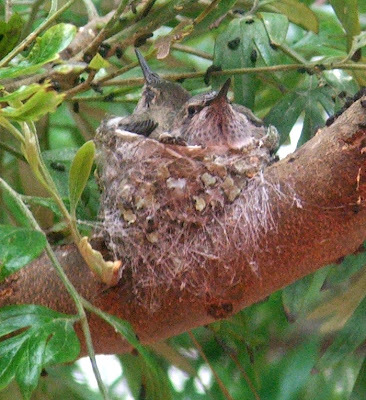 Last weekend we noticed (to be fair, our cat gets credit for first noticing) a hummingbird nest on one of these branches. It’s kind of difficult to see in the photo above but there are two little hummingbirds in there. The nest itself is shaped like and about as big as a teacup. We aren’t sure how long this nest had been there, but once we saw it we watched the mother come back from time to time and feed her offspring. The photo above is a close-up of the little guys waiting impatiently for mom to return with some eats. This was last weekend. They are now gone…over the course of the last two days they each went out on a limb (literally) and then eventually flew away. I kind of miss them….so does our cat.